BREAKING NEWS! Online entries for #PresenterSearchOn3 are now open! McCafe is giving you the chance to fast track yourself past the queue and straight to the judges! 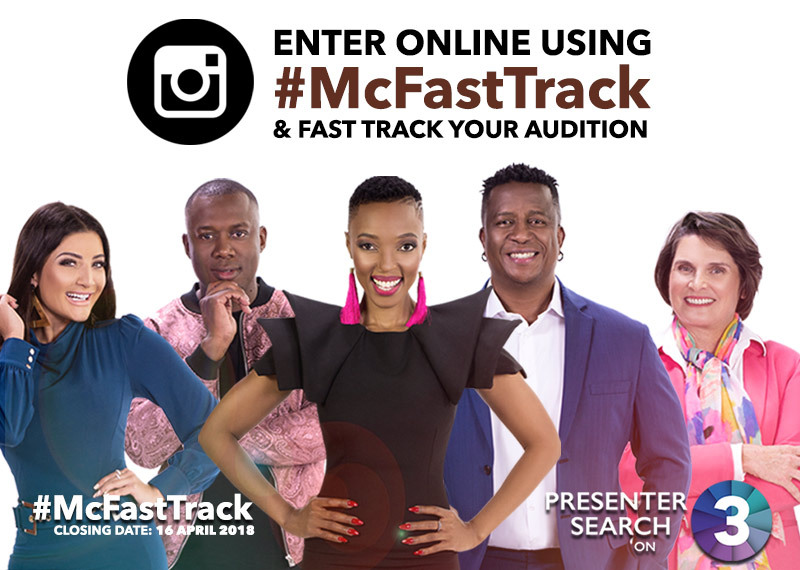 6 lucky winners will be flown into our Joburg auditions, treated to a VIP #McFastTrack experience with Presenter Search on 3 judge DJ Fresh, be interviewed by our host Pabi Moloi and get to skip the queue and go straight to the judging room for their audition! Post a video of yourself doing a 30 second audition in a McDonald’s McCafe on Instagram using #McFastTrack. If you impress DJ Fresh or get one of the top 3 liked videos then one of those 6 spots could be yours! Entries close on 16 April at 19:59. Ts&Cs apply. Only entries received within the entry period will be considered. 1.1 The Presenter Search on 3 McFastTrack Competition (Competition) will be run by Cardova Trading (Pty) Ltd in association with Auram Restaurant Company Proprietary Limited t/a McDonald’s South Africa (McDonald’s). (collectively the organisers/we/us/our). Entries for the Competition will open from Tuesday, 10 April 2018 and will close at 19h59 on Monday, 16 April 2018 (Competition Period). 3.1.4 you must also be eligible to enter and to audition for the 2018 Presenter Search on 3 Competition in accordance with terms and conditions stipulated on the entry form for the said competition. 4.1 You need to film yourself in any McDonald’s McCafe delivering a short audition link for Presenter Search on 3. Upload this clip onto Instagram using the hashtag #McFastTrack. Only entries received within the entry period will be considered. 4.3 You may only enter once for the Competition. 5.1 The top 3 (three) entrants who received the most ‘likes’ on their entries during the Competition Period will be automatic winners. DJ Fresh will, in his sole and unfettered discretion, select a further 3 (three) winners (his favourites) from all valid entries within 2 (two) days from the closing of the Competition. (The 6 (six) winners are hereinafter collectively referred to as the “Winners”). 5.2 We will notify each Winner by commenting on the Winner’s entry post within 24 (twenty-four) hours from determination of the Winner to request a copy of the Winner’s identification document and to obtain necessary information in order to validate his/her entry and to request further contact details. The Winner will be required to provide an electronic copy of his/her identification document as well as a copy of the signed Presenter Search on 3 Entry Form (which will be provided) within 1 (one) day from being requested by us, failing which the Winner will forfeit the Prize and have no claim against us. 5.3 If the Winner does not reply to the notification message sent by us within 1 (one) day from it being sent by us, the Winner will forfeit the Prize and will have no claim against us. In the event of a forfeiture as contemplated herein, we shall have the right to select a different entrant on the same conditions. 5.4 The Winners may also be announced on organisers’ social media pages once the Winners are confirmed. 6.1.2 On 21 April 2018 Winners will be transported to the Presenter Search on 3 Johannesburg Auditions and will be interviewed by host, Pabi Moloi at 10am. Thereafter the Winners will be taken past the queues direct to the Filming Room for their auditions. 6.2.1 Excludes all items not specifically mentioned in clause 6.1. 6.3 The organisers will contact the Winners to provide all necessary information for the Winners to redeem the Prize within 1 (one) day from confirmation of each Winner. 7.2 A Winner will only be confirmed once valid copies of his/her identification document and passport is received and a validation process has taken place. 7.3 We reserve the right to amend these terms and conditions during the Competition Period should it be deemed necessary in our sole and unfettered discretion. 7.5 Where relevant, if the Winner does not accept the Prize as required herein, if an entry is not valid for whatever reason, if the Winner has breached these terms and conditions, if the Winner renounces the Prize or we deem the Winner to have renounced the Prize, we reserve the right to declare the Prize forfeited and/or choose a new Winner. 7.7 We will need to process your personal information to validate your entry as well as to contact you to offer you products and, if you are the Winner, to make the Prize available to you. By entering this Competition, you specifically and expressly consent to us processing your personal information for these purposes and you specifically and expressly consent to us contacting you for marketing purposes. 7.10 We assume no liability whatsoever for any direct or indirect loss, harm or damage arising from your participation in the Competition and/or use of the Prize or for any other loss or damage, howsoever arising. All persons entering this Competition, indemnify and hold us harmless for any loss, damage, harm, death or injury (whether arising from negligence or otherwise) which may be sustained by him/her, or any third party, as a result of or arising from his/her participation in the Competition or use of the Prize. 7.12 The Competition is in no way sponsored, endorsed or administered by Instagram and any correspondence related to the Competition should be directed at us and not Instagram.